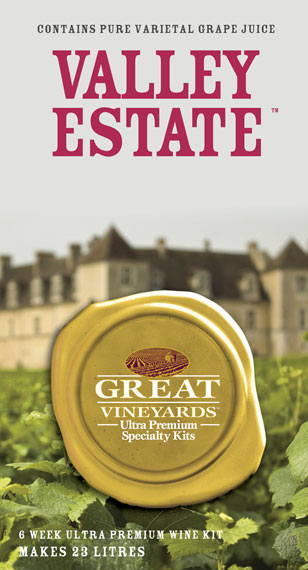 Cellar Estates is an 18 litre Platinum Collection of the “Best Varietals” harvested from the “Best Regions” in the world. 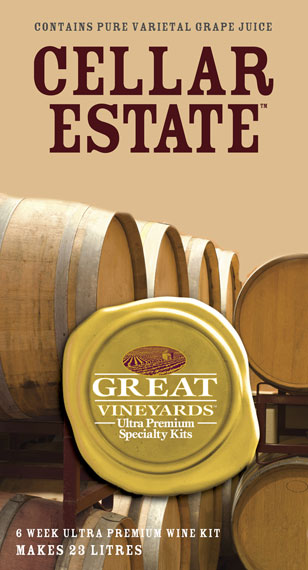 Country and region specific, Great Vineyards Cellar Estates will rival some of the Vintage Wines you have purchased in the past. Limited Varietals from the finest Vineyards around the world, ready for you to create your own signature wine in 6 to 8 weeks. 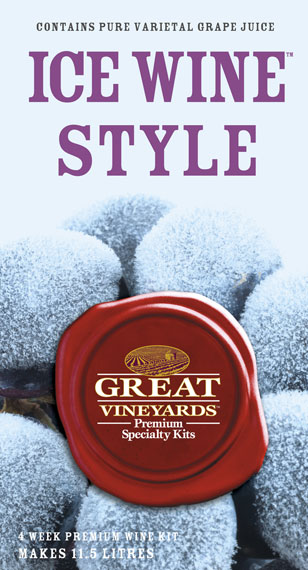 Great Vineyards has raised the bar for Home Wine making by introducing this six week wine making kit. Valley Estates is now 14 litres, region specific and formulated by our own in-house wine maker to ensure you are serving only the best. Vin Bon has made the complicated process of vinting your own wine simple. We’ve sourced hundreds of manufacturers, suppliers, and winemaking professionals to bring to you what we believe is the finest winemaking kits in the world. Here you’ll find everything you need to create that perfect vintage. Assembled from our own experience and the advice of world renowned winemakers, this unique collection of premium kits makes producing wine exciting, inexpensive, and fun. Vin Bon has made the complicated process of venting your wine simple. We’ve sourced hundreds of manufactures, suppliers, and wine making professionals to bring you what we believe is the finest wine making kits in the world. Here you’ll find everything you need to create that perfect vintage. Assembled from our own experience and the advice of world renowned wine makers, this unique collection of premium kits makes wine making exciting, inexpensive, and fun. Sunridge Peak is very low in acid and there is a small amount of invert sugar. At Vin Bon, we firmly believe it’s better to give the customer a smaller, easier to ship, eco-friendly pure juice concentrate as an alternative. 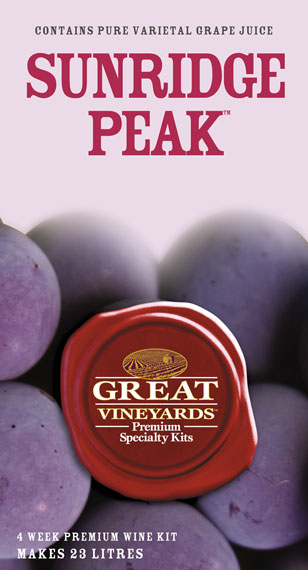 We give you “pure” concentrate to start your perfect batch of wine. Ready in 4 weeks. Some times and event calls for something special. Presenting Great Vineyards Specialty Wines and their unique selection of Ice Wines. Made from grapes selectively harvested under the watchful eye of our experienced ice wine makers, Great Vineyards Specialty Wines continue the grand tradition of signature wines capable of turning the ordinary into the extraordinary. Bold ripe fruit flavours in a distinctively refreshing wine beverage. 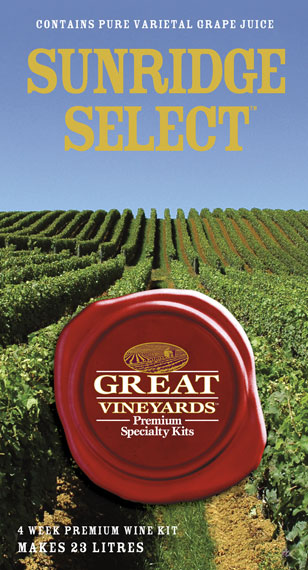 That’s what Great Vineyards Specialty Wine Kits bring to your table. Delightfully light and refreshing with exotic combinations that remind you of that hot summer destination, it takes you away with every sip. When you think of hot summer days, you ultimately think of a cool refreshing beverage to enjoy. 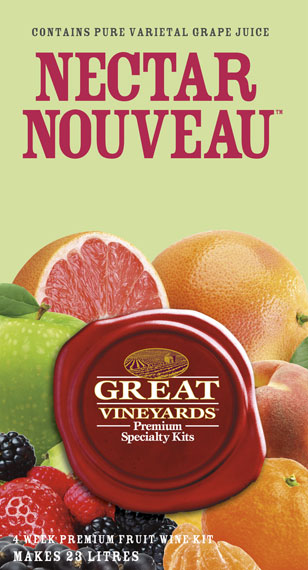 Nectar Nouveau combines exotic fruit with classic wines to create the perfect balance of flavours and bouquet. Lighter in alcohol it is the perfect way to cool down on those hot summer days or simply enjoy it anytime and let it take you back to that tropical destination. Think Caviar only goes well with champagne? Think again. Recently some of the world’s top sommeliers gathered in Moscow to conduct a blind taste test. The clear winner was a Riesling Ice wine. The judges unanimously selected an Ice Wine because the group felt passionately that the saltiness of the caviar simply married best with the sweetness of the Ice Wine.